JUNE / JULY 2008 (view this issue) Susan Gibson (video interview), Adam Carroll (video interview), Mark Jungers (video interview), Hans Frank, Reckless Kelly, Eliza Gilkyson, KNBT Americana Jam, Denice Franke, Paul Thorn, Marcus Eldridge, Michael Hosty, Matt Koger, Fifty Nine South, John D. Hale Band. MAY 2008 (view this issue) Keith Davis Band (video interview), Darryl Lee Rush, Texas Renegade, Zane Lewis, Band of Heathens, Hans Frank & The Auslanders, John M. Greenberg, Devon Heath, Charliehorse, Hayes Carll, John D. Hale Band, Jon Justice, Zach Edwards Band, Southern Drive. 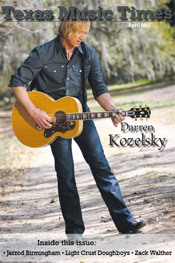 APRIL 2008 (view this issue) Aaron Watson (audio interview), Matthew Ballard, Bluebonnet Blues Festival (video article), The Mighty Orq, Rodney Parker & Fifty Peso Reward, South by Southwest, Eagles, Ryan Bingham, Gary Ritchey, Zach Tate Band, Brison Bursey Band, Stewart Mann and the Statesboro Revue, Mando Saenz, Jackson Browne, County Road 5. MARCH 2008 (view this issue) Rich O'Toole (video interview), Maren Morris, Paula Nelson, Plumtucker, Austin Collins, Zane Lewis, Bart Crow Band, Jimmy Baldwin, Johnny Cooper, Hazzard, Nikki Lee, Chad Johnson and Down 1450, JR Castro, The Border Blasters, Mike Ethan Messick. FEBRUARY 2008 (view this issue) Band of Heathens, Adam Carroll, Bluebonnet Blues Festival, Scott Wiggins Band, Cody Hughes Davidson. JANUARY 2008 (view this issue) Eli Young Band, The Top Albums of 2007, Monte Montgomery, Pear Ratz (video interview), Adam Carroll, Dierks Bentley, Jackson Taylor, Jeffrey Halford, Miles From Nowhere, Nathan Johnson, Jarrod Birmingham. NOVEMBER/DECEMBER 2007 (view this issue) Adam Hood (video interview), Captain Legendary Band, Adam Fears, Jordan Mycoskie, Michael Fitch, Stoney Larue, The Gougers. OCTOBER 2007 (view this issue) Wade Bowen, Adam Hood, Aaron Tilt, Big State Festival, Cross Canadian Ragweed, Doug Moreland, Jason Eady, Josh Grider, Keith Davis, Kevin Fowler, Jimmy LaFave, Mark McKinney, No Justice, Ryan James, Walt Wilkins. NOTE: Between April and October 2007, Texas Music Times recreated itself from a print publication to a web publication. APRIL 2007 (PDF: 11.78MB) Stories: Shooter Jennings, Rich O'Toole, Darren Kozelsky, South Plains Colelge, Texas Music Awards, Zack Walther, Jarrod Birmingham, Kevin Fowler, Buck Jones, Joe Baker, Steve Simmons, Radio Lonestar. Profile Five: Amanda Graves, Stewart Mann, Steve Bedunah, Taking Back Texas, Billy Bourbon. Reviews: Nathan Hamilton, Renegade Rail, The Dust Devils. 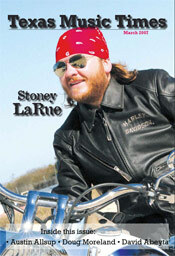 MARCH 2007 (PDF : 10.49MB) Stories: Stoney Larue, David Abeyta, Doug Moreland, Stephanie Briggs, Austin Allsup, SA Indie Festival, Texas Black Heart Brigade, Emory Quinn, Mike McClure, Scott Wiggins Band, Renegade Rail. Profile Five: blacktopGYPSY, Keith Davis, Steve Simmons, Blake and Fallon, Josh Daniels. Reviews: Drew Kennedy, Jay Boy Adams, South First Band. 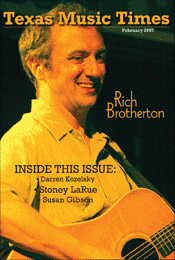 FEBRUARY 2007 (PDF : 11.22MB) Stories: Rich Brotherton, Jesse Fritz, Susan Gibson, Stoney Larue, Darren Kozelsky, Mama Sweet, Ruben V, Blake and Fallon, Mark Monaco. Profile Five: Kevin Pickett, Mike Clifford, Peter Kalla, The Bois d'Arcs, Marcus Rubio. Reviews: Phil Pritchett and The Full Band, Matt Burns Band, Ryan Bingham. 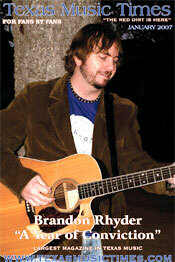 JANUARY 2007 (PDF : 4.83MB) Stories: Brandon Rhyder, Seth Allen, Buster Jiggs, Bleu Edmondson, Best of 2006, Austin City Limits, Kosciusko Texas, Casey Donahew, Musicfest 2007, A Perspective on Red Dirt Music, The Roadhouse Tradition, Zack Walther, Band of Heathens, Adam Hood, Johnny Cooper, Michael O'Neill, LA Freeway. Profile Five: Nikki Lee, Rachel Laven, Graham Weber, Tracy Nicole, Britt Lloyd Band. Reviews: Britt Lloyd Band, Todd Snider, Brandon Jenkins, Tyler McCumber Band. NOVEMBER 2006 (PDF : 2.23MB) Stories: Jason Boland and the Stragglers, Johnny Cooper, Sterling Finlay, Robert Cherry, Granger Smith, The Wormy Dog, Wade Bowen, Eli Young Band, Ryan Bales, South of Nowhere, Jack Ingram's RAMFest, Hayes Carll, Joe Ely, Coyote Funeral, The Claw, Bleu Edmondson, Bart Crow Band, Billy Joe Shaver. Profile Five: Brandon Key Band, Dr. G and the Mudcats, Jackson Parten, Rich O'Toole Band, The Pear Ratz. Reviews: Mike McClure Band, Full Throttle, Trent Summar, Cross Canadian Ragweed. 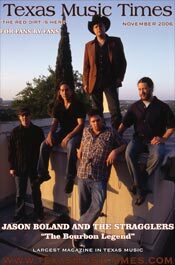 OCTOBER 2006 (PDF : 4.42MB) Stories: Randy Rogers Band, Josh Grider Band, Roger Ray, Cody Gill Band, Cody Braun, Lonestartime Italian Webzine, Doug Moreland, Full Throttle, Kenny Wayne Shepherd, Honeybrowne, Jason Herd, Micky Braun, No Justice, Pearl of Bastrop, Kevin Fowler, Ginn Sisters, Ziegfest, 10 City Run. Profile Five: Ben Danaher, Brian Burke, Carl Slack, Mike Amabile, Tony Taylor. Reviews: Plumtucker, Wicked Brew, 10 City Run, Autumn Boukadakis. SEPTEMBER 2006 (PDF : 5.31MB) Stories: Mike McClure, Zane Lewis, Keith Davis, Reckless Kelly, Saengerhalle, Ryan Turner and Marshall Foster, Brandon Rhyder, Junior Brown, Todd Purifoy, Wildcatter Ranch, Cory Morrow, Micky and the Motorcars, Cross Canadian Ragweed, The Snorty Horse, The State of Music, Summer of the Hawk, Big Fest '06. 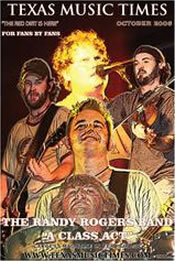 Profile Five: Brandon Jones, Cactus Jones, Granger Smith Band, Highspeed Hayride, Tommy Gallagher Band. Reviews: Randy Rogers Band, Carter Falco, Rich O'Toole, Eric Hanke, Jason Eady.